Soybean hulls are a by-product of the extraction of oil from soybean seeds (Glycine max (L.) Merr.). After entering the oil mill, soybeans are screened to remove broken and damaged beans, and foreign material (Extension, 2008). The beans are then cracked, and their hulls, which mainly consist of the outer coats, are removed (see figure above). Hulls are fibrous materials with no place in human food, but are very valuable for ruminants (Ipharraguerre et al., 2003). Soybean hulls are often reintroduced in the final oil meal in order to reduce its protein content, resulting in soybean meal types with a maximum protein + fat guarantee of 44 to 48%. However, this end use decreases when the demand for high protein soybean meal increases. Soybean hulls are thus available and very valuable feeds for on-farm feeding of cattle (Extension, 2008). Soybean hulls are light, flaky, and bulky. They require special consideration when handling: closed feeders are necessary when soybean hulls are fed outside, since the wind tends to blow the hulls away. During transportation, closed and covered trailers are also required (Extension, 2008). Pelleting hulls is a way to reduce bulkiness and reduce transportation costs, even though many manufacturers prefer unpelleted hulls to prepare compound feed (Blasi et al., 2000). Soybean hulls are available wherever soybeans are produced. It is estimated that soybean hulls represent about 5% of soybean weight (Blasi et al., 2000). According to world production of soybean, which was 308 million tons in 2014, it can be estimated that the production of soybean hulls was about 15 million tons in that year (FAO, 2016). Only a part of the total production is used directly as feed, since hulls are reincorporated in soybean meal to comply with the intended protein content (Extension, 2008). Soybean hulls have to be heat-treated and milled to reduce their bulkiness and lower their urease activity (Extension, 2008). After cracking of soybeans, the hulls first pass through a sieve which separates fines and meats from the true hulls. The hulls are then toasted in order to destroy the urease enzyme (see Potential constraints on the "Nutritional aspects" tab) (Blasi et al., 2000). 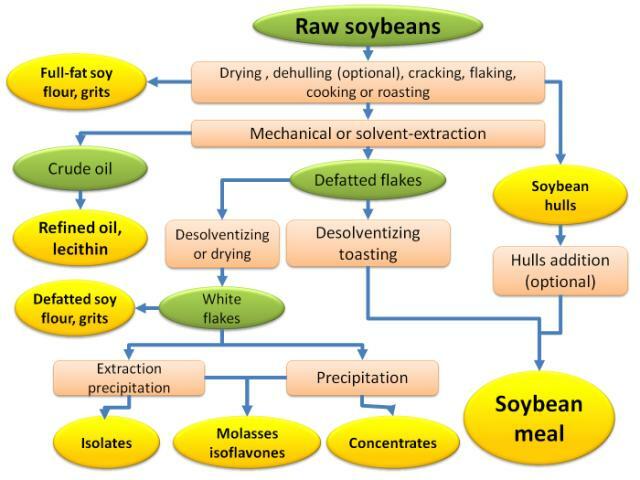 After heat treatment soybean hulls are referred to as soybean mill run, soybean flakes, or soybran flakes (Boyles, 1999). Since soybean hulls have a very low density, they can be milled and pelleted to lower bulkiness. However, many feed manufacturers prefer using unpelleted soybean hulls to make their own pellet mixtures (Blasi et al., 2000). The nutritional value of soybean hulls is quite good but also highly variable (Extension, 2008; Blasi et al., 2000). The variability of soybean hulls is mainly due to the misclassification between well-cleaned soybean hulls and soybean mill feed or soybean mill run, two by-products that still contain particles of seed kernels, and are thus higher in protein and lower in fibre (Blasi et al., 2000). As a result, products marketed as "soybean hulls" can have a relatively high protein content (9-18% DM), and be highly digestible (Blasi et al., 2000; Extension, 2008). The fibre in soybean hulls is rapidly fermented and may contain substantial amounts of pectin. Soybean hulls have a high NDF (52-74% of DM), but because of their small particle size, the effective NDF is much lower (Boyles, 1999). Soybean hulls are sometimes considered an energy feed rather than a roughage (Extension, 2008). Trypsin inhibitors: raw soybeans and soybean hulls contain trypsin inhibitors that bind with trypsin in the small intestine, and form an inactive complex that prevents trypsin from degrading feed proteins (van Eys et al., 2004). Trypsin inhibitors also induce pancreatic enlargement, increase trypsin secretion and, therefore, lower N retention, growth and feed conversion (van Eys et al., 2004; Rackis et al., 1986). Due to these antinutritional factors, raw soybean hulls are not recommended for feeding. Ruminants are not as sensitive as other livestock species because trypsin inhibitors are deactivated and degraded in the rumen (Hoffmann et al., 2003). However, trypsin inhibitors are heat labile and largely destroyed by it (Rackis et al., 1986), so heat treatment is required before feeding soybean products to animals, particularly to monogastrics. Lectins are also heat-labile. They are found in soybean seeds, but no information could be found about their presence in soybean hulls. Saponins are glycosides that reduce the uptake of other nutrients. Tannin content of soybean hulls is higher than that of whole soybeans (2.31 vs. 1.52 mg catechin equivalent/g) (Egounlety et al., 2003). Others antinutritional factors: soybean may contain antivitamins, urease and plant sterols that may interfere with the absorption of carotenoids and vitamin E (Brown et al., 2008). Like soybean seeds, soybean hulls may contain the urease enzyme. If soybean hulls are fed in association with feeds containing urea, urease may cause the rapid breakdown of urea into ammonia, which accumulates in the rumen. Rumen microflora may be unable to handle large amounts of NH3, which are carried by the systemic circulation and may cause sudden death in cases of acute toxicity (Newkirk, 2010; Decker, 1996). In other cases, it may lead to excessive NH3 excretion into the environment, and poor N utilization (Kertz, 2010). When soybean hulls are mixed with other feeds, urease is generally destroyed (Extension, 2008). When hungry animals eat soybean hulls too quickly, there is some risk of choking. However, when this occurs animals mostly relieve the obstruction without help. A way of limiting the risk of choking is to mix soybean hulls with other feed, top-dress with other feeds, or feed the soybean hulls after other elements of the diet (Schoenian, 2015). The copper content of soybean hulls is about 17 ppm. In sheep, it is thus likely to raise the copper content of the ration above the maximum tolerable level (15 ppm) that sheep can tolerate when they are offered diets containing “normal” levels of molybdenum and sulphur. Where the risk of copper toxicity occurs, it may be advised to provide sufficient molybdenum in the diet to prevent problems (Schoenian, 2015). When the weather is both warm and humid at the time of soybean harvest, fungi development may result in the production of mycotoxins. Among them, zearalenone in particular is concentrated in the hulls (Jacobsen et al., 1995; Valenta et al., 2002). The potential health issues of genetically-modified soybeans and other GM foods is a matter of considerable debate. While most studies have failed to show deleterious side-effects to the use of GM soybean (EFSA GMO Panel, 2008), these varieties remain controversial and subject to legal authorisation in some countries. Soybean hulls have a high nutritive value for ruminants, and they are a highly digestible fibre source: supplementing diets with soybean hulls increases rumen microflora flow and rumen fibre digestion. However, soybean hulls do not provide as effective fibre (large particle size) as roughages, and this should be taken into account when replacing forages with soybean hulls (Boggs et al., 1997). Soybean hulls may be used as an energy source to supplement low to medium quality forage based diets, and they can also be used to replace part of the concentrate in the ration. In the USA, soybean hulls are often used to replace hay or maize in cattle diets during winter (Boyles, 1999). Soybean hulls are a highly digestible fibre source that is readily consumed by dairy cows. However, soybean hulls do not provide long fibre and are not as effective as roughages. Several experiments have attempted to define the optimal levels for soybean hulls in different diets (Blasi et al., 2000). Milk production of lactating dairy cows is very variable when soybean hulls are included in the diet (Bateman et al., 2000; Blasi et al., 2000). There are two ways to include soybean hulls in dairy cow diets: they can be used to replace part of the forage, or they can be used as an energy source and replace part of the concentrates. When soybean hulls replaced part of the roughage in dairy cow diets, they provided higher energy without causing acidosis that usually occurs with high energy feeds such as maize grain (Blasi et al., 2000). However, depending on the amount, type and physical form of the dietary forage it replaces, the influence of soybean hulls may be positive or negative. From the results above, it could be concluded that in diets for dairy cows containing more than 50% forage the inclusion of soybean hulls could range between 15 and 25% (of the diet DM) and result in higher DM intake and an increased yield of fat-corrected milk (Blasi et al., 2000). It is generally advised to limit soybean hulls to 25% when they are replacing forages in a diet (Ipharraguerre et al., 2003). Cows in very early lactation (less than 30 days in milk) should probably not be fed soybean hulls since they are prone to displaced abomasum when effective fibre is low (Newkirk, 2010). When soybean hulls were used to replace energy feed like maize grain, they were safely included in dairy cow diets at up to 40% dietary level without compromising milk yield, fat-corrected milk yield, milk protein or milk lactose. But as for the replacement of forages, caution should be exercised because the response to feeding soybean hulls is largely affected by the type of carbohydrates that is replaced by the hulls (Ipharraguerre et al., 2003). Milk fat increased linearly with increasing amounts of soybean hulls in the diet (Lima et al., 2009; Pedroso et al., 2007; Cunningham et al., 1993). Soybean hulls allowed cows to spend winter on stockpiled tall fescue without too much expenditure on hay (281 kg hay were spared per cow). Weight loss in cows was also reduced (Kerley et al., 1995). Gestating cows grazing on dormant native range were fed on soybean hulls rather than on soybean meal. The cows fed soybean hulls had higher weight gains than those fed soybean meal (Marston et al., 1992). Soybean hulls enhance the performance of backgrounded calves placed on grass pastures or grass/clover hay (Boyles, 1999; Allison et al., 1993). Using soybean hulls as a supplement (instead of maize grain) to steers fed on tall fescue (Festuca arundinacea) (or any other forage of low to moderate quality) gave similar positive results as a maize supplement (about 1 kg daily weight gain) (Boyles, 1999). Many studies confirm this result (Galloway et al., 1993; Duff et al., 1993; Anderson et al., 1988; Highfill et al., 1987; Brown et al., 1981). It has been reported that feeding soybean hulls to steers grazing on tall fescue infested by Neotyphodium coenophialum can alleviate health problems due to toxic tall fescue, such as sleek hair coat (Carter et al., 2010). However, these results were not consistent with previous results obtained earlier (Aiken et al., 2008). Holstein steers fed on Bahia grass hay (Paspalum notatum) were supplemented with soybean hulls (0.75% BW) or soybean hulls and molasses, or soybean hulls, molasses and urea. Cattle receiving soybean hulls had higher daily gains. They also had higher urea nitrogen in their blood plasma, which was reduced by the addition of molasses. Hay intake was not reduced by soybean hulls supplementation (Kostenbauder et al., 2007). Fall-weaned steer calves grazing on higher quality forage, such as wheat forage, gave similar responses with soybean hulls as with maize grain. The feed conversion ratio was improved, the stocking rate on pasture increased by 30%, and daily weight gains were 150 g higher (Cravey et al., 1993). It was shown that supplementing cattle with only 1 kg soybean hulls had the same positive effect on hay intake as supplementing cattle with maize grain, in spite of the difference between the two feeds for true digestible nutrients (91% in maize vs. 77% in soybean hulls). This could be attributed to the high digestibility of the fibre in soybean hulls (Blasi et al., 2000). It is important to notice that the high fermentability of soybean hulls may result in some rumen distension if cattle consume large quantities of the hulls (Blasi et al., 2000). When soybean hulls were used as the main ingredient in a diet for growing cattle, it compared favourably with a traditional roughage-based diet, resulting in lower feed intake, slightly lower daily gains and an improved feed conversion ratio. When soybean hulls were compared to high-energy based diets fed at a fixed rate (1.5% BW vs. 2.25%), they resulted in higher intake, higher weight gains and better feed conversion ratios (Blasi et al., 2000). Soybean hulls successfully replaced maize grain in creep calf diets (Faulkner et al., 1994). It was possible to use soybean hulls in high-concentrate diets for finishing cattle. Soybean hulls replaced 25% of grain sorghum without changes in daily gain or feed efficiency (Coffey et al., 1989). It was suggested that soybean hulls had 74% of the feeding value of maize grain when it was included at up to 60% (DM basis) in the diet (Ludden et al., 1995). Lactating ewes fed on soybean hulls and distillers grains, completely replacing hay in the diet, had a higher milk production than ewes fed a hay-based diet, but milk fat percentage was lower. Lamb performance was higher for the ewes that produced more milk (Zelinsky et al., 2014b). When soybean hulls were included in order to replace 33, 67, and 100% of the NDF of the hay in lactating ewe diets, feed intake and milk production increased (Araujo et al., 2008). 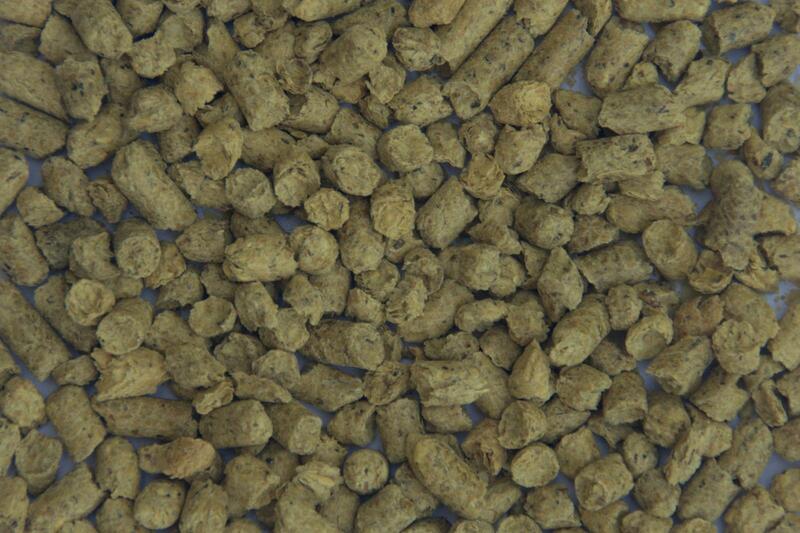 Soybean hulls were used as an energy and fibre source in lamb finishing diets. Lambs had a higher dry matter intake, but also a reduced feed efficiency, compared to traditional corn-based diets (Zelinsky et al., 2014a). In lactating goats, as in lactating cows, soybean hulls are an energy source that can replace maize grain. They totally replaced maize grain in maize silage-soybean based diets offered to lactating goats in early lactation (Zambom et al., 2012). Inclusion of soybean hulls had no negative effects on body weight, daily weight gain, and intake (kg/day) of dry matter, organic matter, crude protein or indigestible NDF. They increased NDF intake and digestibility coefficients and, while no changes were observed in milk yield, milk production efficiency and milk composition, the inclusion of soybean hulls increased the content of n-3 fatty acids in milk (Zambom et al., 2012). Because of their high fibre content, soybean hulls have not been included routinely in pig diets (Lewis et al., 2001). Including soybean hulls in pig diets was reported to decrease the DM, N and amino acid digestibilities of soybean meal-based diets for growing pigs (Dilger et al., 2004). A decrease of 0.2% in the true digestibility in the ileum of some essential amino acids was caused by each 1% increase in soybean hull inclusion (Dilger et al., 2004). However, other experiments have shown that soybean hulls could be used as an alternative feed for pig diets (Chee et al., 2005; DeCamp et al., 2001). Soybean hulls are not recommended for piglets. They were shown to reduce daily feed intake and weight gain in animals fed on diets containing 15% soybean hulls compared to the control diet without soybean hulls (Moreira et al., 2009). Soybean hulls were included at 10% in growing pig diets and at 12% in fattening pig diets without hindering palatability or animal performance. They replaced wheat bran without any problem (Chee et al., 2005). It has been reported that feeding 10% soybean hulls to fattening gilts or barrows (above 85 kg) had positive effects on growth rate, feed conversion ratio, and carcass characteristics (DeCamp et al., 2001). Growing pigs fed a supplement of soybean hulls up to 15% of the diet did not experience any depression in average daily gain or feed intake, although metabolizable energy intake was decreased linearly as the level of soybean hulls increased. In this experiment the most efficient conversion ratio was observed in pigs receiving diets containing 15% soybean hulls (Kornegay, 1981). In Thailand, it was shown that the inclusion of 20% soybean hulls to replace rice bran in sow diets had no adverse effect on the reproductive performance. Litter size at weaning, and feed intake during lactation were increased (Kanto et al., 2009). The use of soybean hulls at up to 19% in sow diets was reported to reduce aggression in pregnant sows housed in groups, and to increase their intake to satiety when limit-fed, thus improving their overall welfare (Sapkota et al., 2016). Because of their high fibre content, soybean hulls are not commonly included in poultry diets. However, successful inclusion of soybean mill feed in poultry rations has been reported (Muir et al., 1985 cited by Newkirk, 2010). In laying hens, up to 20% soybean hulls (with a high level of N) resulted in an improved feed cost per dozen eggs. Under cellulolytic enzyme supplementation this level was increased up to 30% without hampering the performance of laying hens (Esonu et al., 2010). Soybean hulls are a common source of fibre in rabbit feeding in Western Europe (Villamide et al., 2010). The inclusion rate is generally between 5 and 10% for commercial diets (Gidenne et al., 2000; de Blas et al., 2010). Satisfactory results have been obtained in studies on soybean hulls utilization for rabbit feeding in other countries such as Nigeria (Orji, 2009), Egypt and Mexico (Safwat et al., 2014), Brazil (Arruda et al., 2002; Arruda et al., 2003), and Romania (Martina, 1983). In experimental studies, it was possible to increase safely the inclusion rate up to 25-30%, and in some trials as high as 40% (Arruda et al., 2002; Gutiérrez et al., 2000; Nicodemus et al., 1998). However, when including soybean hulls above 25-30% in diets for growing or reproducing rabbits, special attention must be paid to the lignin content of the complete diet, because of their low content of lignin (de Blas et al., 1999), and their relatively high fibre digestibility (Garcia et al., 1997; Gidenne et al., 2000). The ADF digestibility of soybean hulls is close to that of alfalfa (Evans et al., 1983), but the proportion of the more digestible hemicellulose and the digestible soluble fraction is higher. As a consequence of the proportions and digestibility of the various fibrous fractions in soybean hulls, the digestible energy content is about 7.5 to 8.0 MJ/kg DM, i.e. a little bit lower than that of dehydrated alfalfa (Maertens et al., 1984; Maertens et al., 2002; Garcia et al., 1997; Perez et al., 1998). In addition to fibre and energy, soybean hulls provide protein with a concentration close to the minimum recommended for growing rabbits (Lebas, 2013), with a digestibility coefficient (65%) similar to that of alfalfa (Villamide et al., 2013). Soybean hull protein is relatively rich in lysine but deficient in sulphur-containing amino acids: 126% and 78%, respectively, of the recommendations for balanced proteins used in rabbit nutrition (Lebas, 2013). Soybean hulls provide less than 50% of the calcium and phosphorus necessary for rabbits (Lebas, 2013). Attention should be paid to zearalenone, which may be concentrated in soybean hulls, in case of fungal contamination, and should not exceed 0.50 mg/kg in the final complete feed (Mézes et al., 2009). A mild contamination (0.5-1.0 mg/kg) could have an apparent favourable action on the performance of growing rabbits, but it is clearly toxic for adult rabbits with lesions being seen in most organs, e.g. liver, kidneys, lung, heart, spleen or uterus (Abdelhamid et al., 1992). Diets with up to 28% soybean hulls in the concentrate can be used as equine feed without negatively affecting digestibility, short-chain fatty acids concentrations or selected microbiota, as well as physicochemical characteristics in the faeces (Kabe et al., 2016). DeCamp, S. A.; Hill, B.; Hankins, S. L.; Herr, C. T.; Richert, B. T.; Sutton, A. L.; Kelly, D. T.; Cobb, M. L.; Bundy, D. W.; Powers, W. J., 2001. Effects of soybean hulls on pig performance, manure composition, and air quality. Purdue Univ., Swine Res. Rep.
Nicodemus, N.; García, J.; Carabaño, R.; de Blas, C., 1998. Effect of the inclusion of soybean hulls in commercial feeds on rabbit digestion and performance at varying dietary lignin concentration. American Soybean Association, 21 pp. Orji, J. A., 2009. Nutrient intake, digestion and utilization by rabbits fed cowpea hull and soybean hull based diets. Doctoral dissertation, Dept. Anim. Sci., Univ. Nigeria, Nsukka, Nigeria 90pp.